After the death of their young daughter, Neil Armstrong (Ryan Gosling) and his wife, Janet (Clare Foy), welcome the opportunity to join Project Gemini, NASA’s ambitious human spaceflight programme. Both believe that this is the fresh start they so desperately need. However, neither could possibly have imagined the journey their family and the world would soon be taking and the true cost of man’s mission to the moon. Damien Chazelle does something remarkable in his superb film, First Man. He takes a historic event, one of the most iconic and well known stories in modern times and creates something fresh. Really, who would have thought there was anything new left to say about Neil Armstrong and the Apollo moon landing? While it is based on the book by James R. Hansen (which I have not read… yet), First Man is no traditional biopic. The film focuses on a specific time frame - the decade leading up to Apollo 11 - and steadfastly refuses to retread the Armstrong timeline we know so well. Instead we find a man overwhelmed by loss, a loving husband and father isolated by grief and devoted to his work. Superbly portrayed by Ryan Gosling, Armstrong is quiet and reserved with exceptional focus and unwavering determination. Despite the dangers of NASA’s moon mission, Armstrong has the coolest of cool heads (and a wonderful dry sense of humour) and is able, on several occasions, to manoeuvre himself out of the most challenging situations. You see, this is not the NASA we know so well from (the many) Apollo stories. This is not a NASA full of shiny rockets and sleek launches, it’s a nuts and bolts space programme made, as Janet Armstrong (a compelling and powerful performance from Clare Foy) observes, out of balsa wood. The controversial risks (and financial cost) of the moon mission are certainly made clear in First Man. The astronauts and their families live in the shadow of almost inevitable tragedy. Loss is a part of their lives and it takes a devastating toll. First Man is utterly immersive. Chazelle wanted his audience to feel as if they were in the rockets (and various other aircraft) with Armstrong. From the film’s opening scenes until its very last moments, the director more than succeeds in his aim. The film’s soundscape is tremendous - full of alarming bangs, howls and rattles. Meanwhile, the camera shudders and shakes convulsively. It is a dizzying, disorientating experience - one that gives us an inkling of what it must have been like to be an Apollo astronaut. Linus Sandgren’s superb cinematography ensures First Man's incredible authenticity. However, the film also has a thoughtful, ethereal quality. There are stunning moments of silence and equally breathtaking and magical moments that combine beautiful visuals with Justin Hurwitz’s exquisite score. This is a remarkable film - one that stays with you long after you leave the cinema. First Man humanises a truly iconic tale - giving it greater emotional depth and power than the history books will often allow. Chazelle's confident storytelling is aided by the co-operation of Armstrong’s family and consultations with astronauts including Jim Lovell. His film honours those who took part in the race to the moon - both within the space programme itself and the families left at home. First Man surprises us with a moving and deeply personal story of grief and loss. This is both a fascinating and humbling tale about an extremely courageous group of people and an intimate and poignant portrait of one of the most famous men in history. 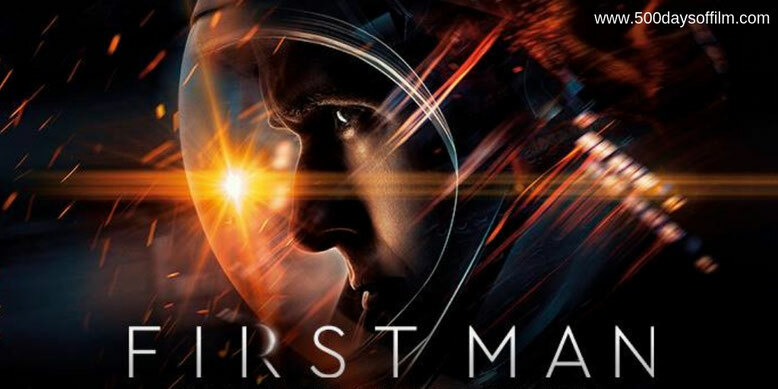 Have you seen First Man? If you have, what do you think of Damien Chazelle’s film? Let me know in the comments section below or over on Twitter. You can find me @500DaysOfFilm.